I've written several series, but my first published novels were the beginning of the four-part story of Garth of Ordunin. The four can be read independently, but are really parts of a single story and are best read straight through, in order. That used to be somewhat inconvenient when the four novels were only available in separate volumes that might or might not all be in print at any given time. Now, though, thanks to Wildside Press, all four should be available indefinitely as individual trade paperbacks and e-books, and in a hardcover four-in-one omnibus, complete with extensive historical appendices. There are no spin-offs, sequels, or related works beyond the four original novels and their appendices -- at least, not as yet. First omnibus edition published March 2003 by Wildside Press, ISBN 1-58715-665-2, with cover art by Dalmazio Frau . The cover of the omnibus edition, over there to the right. Click on the cover image to see it closer to full-size. A few places you can buy the omnibus edition. A link to Wildside Press, the current publisher of the series, including the first omnibus edition. Eventually I may add more stuff, such as a longer FAQ, but for now, that's it. 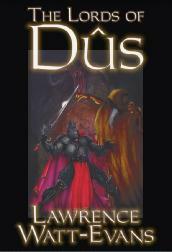 The Lords of Dûs was first published in single-volume form by Wildside Press, ISBN 1-58715-665-2, as a collectors' hardcover with several updated appendices explaining the history of the story. The cover art is by Dalmazio Frau . There are no other complete editions. Having the cycle of time broken, however, probably has the greatest effect on people. Under P'hul, everything anyone attempted was doomed to eventual slow failure. Under Bheleu, everything was destined to end in disaster. With the Dûs gone and the Ages ended, this sort of predestination isn't there; plans can work or not work according to how well they were devised, or ordinary dumb luck. This means that the established order, which had decayed under P'hul and been largely destroyed by war under Bheleu, can finally be replaced by new organizations.